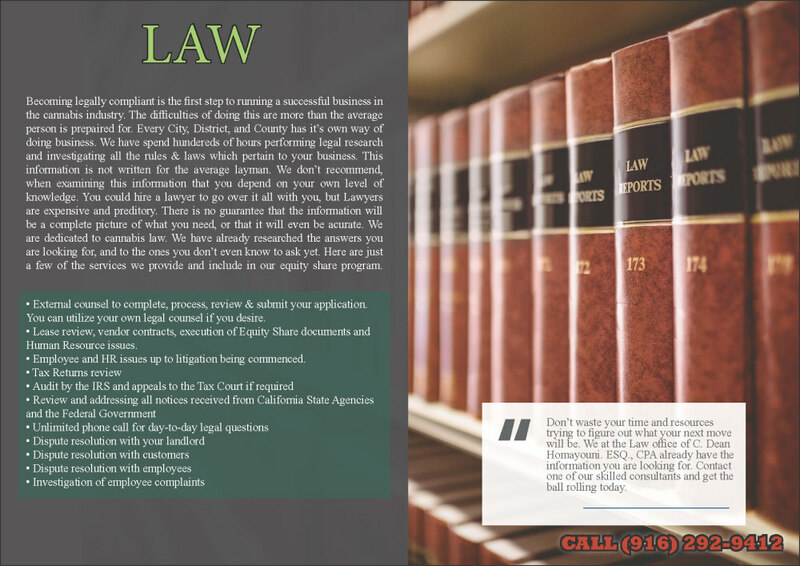 We Step You Though the Application and Licensing Processes and Provide You With Peace of Mind That No Big Legal Bill is Going to Land on Your Desk. Lawyers are expensive and some are predatory. We have actual knowledge of a law firm billing a dispensary $490,000 in one year for regular legal work. We understand there is no assurance you will get a dispensary because of the limited availability. By being an Equity Share participant; we remove that concern. As part of the risk we take we analyze the probability of your getting a dispensary or mobile delivery service in your preferred geographical area. We only accept One Stop Shop applicants based on the applicant understanding the reality of the situation and listening to our advice. There is no charge for our advice for the initial consultation. Just remember; our time is valuable and when we request information as support for your license application it has to be delivered promptly. We are your partner and not your baby-sitter. Our qualifications for the One SAtop Shop program are intense. We spend many hours and a lot of our financial resources to get your business off the ground; including cars, inventory, security systems, POS and accounting systems and training your staff. It is not easy and takes time. There are a lot of companies that claim to be cannabis experts but have never run a company or put any of the cash into the industry. We are the exact opposite. IF I BECOME A ONE STOP SHOP PARTICIPANT WHAT LEGAL FEES ARE COVERED? All time and expenses incurred by external counsel to complete, process, review and submit your application. You can utilize your own legal counsel if you desire. Tax Return review and approval by our retained external counsel and certified public accountants. All workplace related complaints and issues up to litigation commencing.